From California's majestic redwoods to New York's apple orchards, carry the place that has your heart. Celebrate your home state wherever you roam by taking along this charming tote. Whimsical illustrations and playful poems using the state nickname are an ode to its natural beauty, highlighting the landscapes, plants, animals, and special details that make it unique. From California's majestic redwoods and dramatic Joshua trees, to New York's apple orchards and forest glades, carry the place that has your heart—and all your everyday essentials, too. 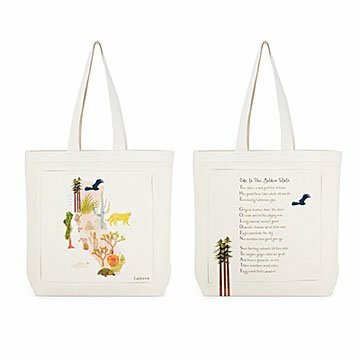 Made of durable canvas, each tote features sturdy straps and a zippered pocket for smaller items. Illustrations by Sandra Dumais. Poems by Martin Geller. Click here to see our Ode to Home State Pillow. Alabama, Alaska, Arizona, Arkansas, California, Colorado, Connecticut, Delaware, Florida, and Georgia here. Hawaii, Idaho, Illinois, Indiana, Iowa, Kansas, Kentucky, and Louisiana here. Maine, Maryland, Massachusetts, Michigan, Minnesota, Mississippi, Missouri, Montana, Nebraska, Nevada, New Hampshire, New Jersey, New Mexico, New York, North Carolina, and North Dakota here. Ohio, Oklahoma, Oregon, Pennsylvania, Rhode Island, South Carolina, South Dakota, Tennessee, and Texas here. Utah, Vermont, Virginia, Washington, West Virginia, Wisconsin, and Wyoming here. This bag is part of a Texas themed item, combined with a Texas flag for a fund-raiser/silent auction. Is an attractive, designer bag & is very good quality. It will be a popular item, as there are so many uses for it. And it will be original, not many duplicates in the are. And the colors give the feel of Texas without being too red, white & blueâ€”colors of the State. I'm giving this 5 stars, because it was exactly as i was hoping it would be. It's about a $20-$30 tote. Would be great for the farmers market or a small trip to the grocery store. So the extra is for the art which was the reason I bought this bag. You never know for sure what you're getting in terms of quality. But it's a high quality bag - very thick canvas material. Straps are renforced w/ a vertical 1 1/2 in strip of canvas sewed into the top of bag - so you can probably put a lot in it. I got it for a friend that lives in and loves California. Poem is pretty, and she will enjoy reading it when she's in the grocery line. Filling it with thing from Massachusetts for my niece.